Placing a custom teardrop flag in front of your business establishment or at your next trade show is a great way to grab the attention of a passerby. 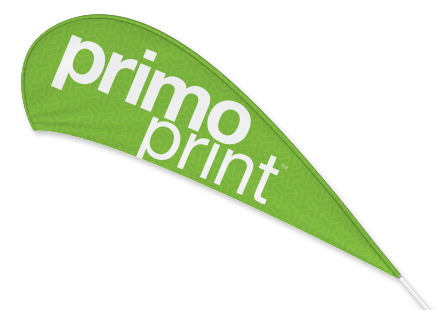 These eye-catching flags are ideal for promoting a business, grand opening, special event, product or service. Printed on one side only on durable, light-weight, flame resistant 3oz polyester fabric making them easy to transport and assemble. Choose from a large selection of sizes to meet your marketing needs. Optional hardware is available for both indoor and outdoor uses. The outdoor flag will include a pole and ground stake or cross base and pole for indoor purposes. If you are receiving additional hardware, the flag along with the equipment will be included in a convenient carrying case. Get started today and increase the impact of your message and maximize your exposure with premium flags. Material and Printing: They are printed single sided on a lightweight, flame resistant 3oz polyester using superior sublimation equipment, for the longest lasting color of any type of printing available for fabric. How to Care for Your Flag: They can be machine washed in cold water with mild detergent using the gentle cycle, no bleach. Tumble dry on low to prevent fabric shrinking, and steam to release wrinkles if necessary. Please Select 32" x 70" 44" x 87" 45" x 97" 57" x 142"